The Archdiocese of Miami's Office of Black Catholic Ministry is working and praying for the canonization of six black Catholic candidates for sainthood: Venerable Mother Henriette Delille, Servant of God Mother Mary Lange, Servant of God Augustus Tolton, Venerable Pierre Toussaint, Servant of God Sister Thea Bowman and Julia Greely. 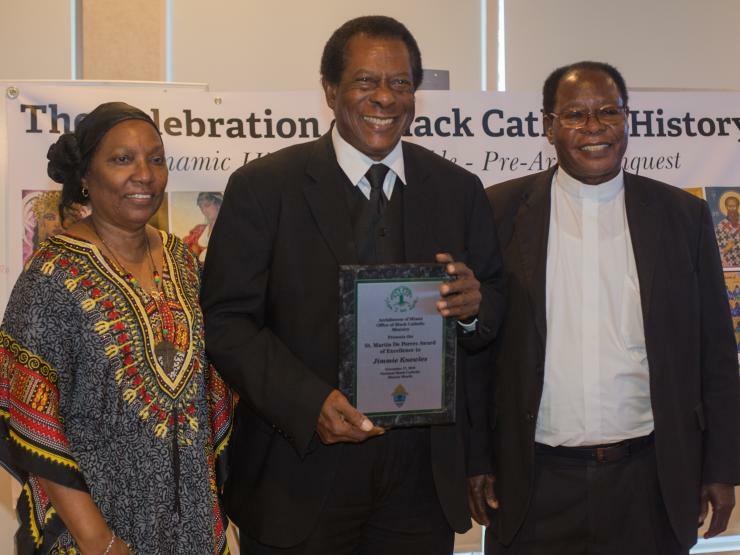 The Archdiocese of Miami Office of Black Catholic Ministry celebrated Black Catholic History Month by presenting its annual St. Martin de Porres awards to exemplary members of the community. 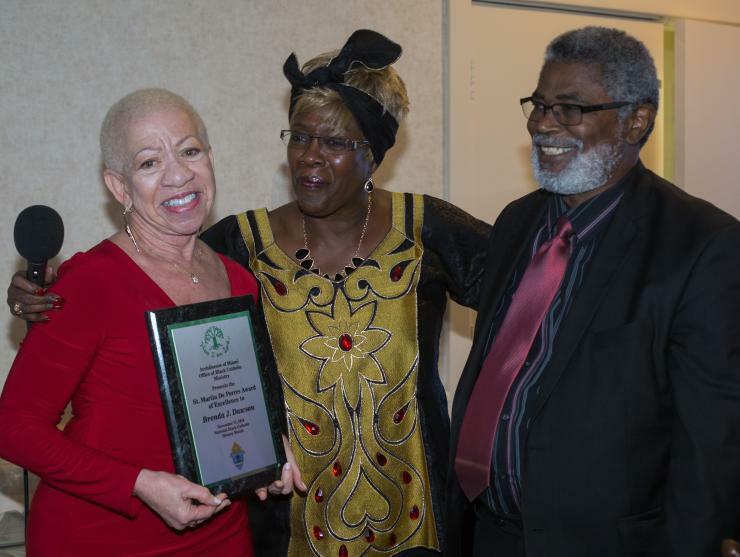 The awards were presented during a luncheon Nov. 17 in Miami Gardens. 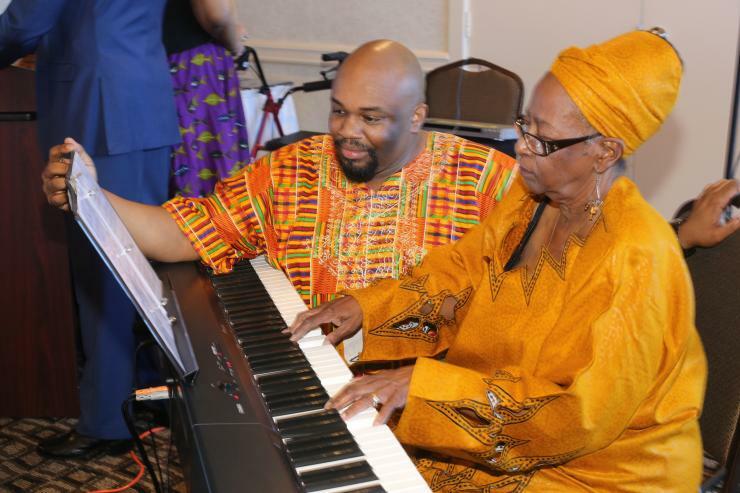 Donna Blyden plays the keyboard as Robert Brown turns the pages during the archdiocesan Office of Black Catholic Ministry's celebration of Black Catholic History Month at a luncheon Nov. 17 in Miami Gardens. 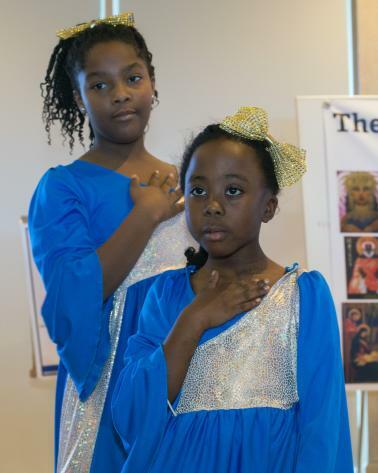 Megan Juste, 12, and Kayla Weaver, 7, members of Mbofro Ne Nyame, "Children and God" dance group, perform for the audience during the Archdiocese of Miami's Office of Black Catholic Ministry celebration of Black Catholic History Month, Nov. 17 in Miami Gardens. 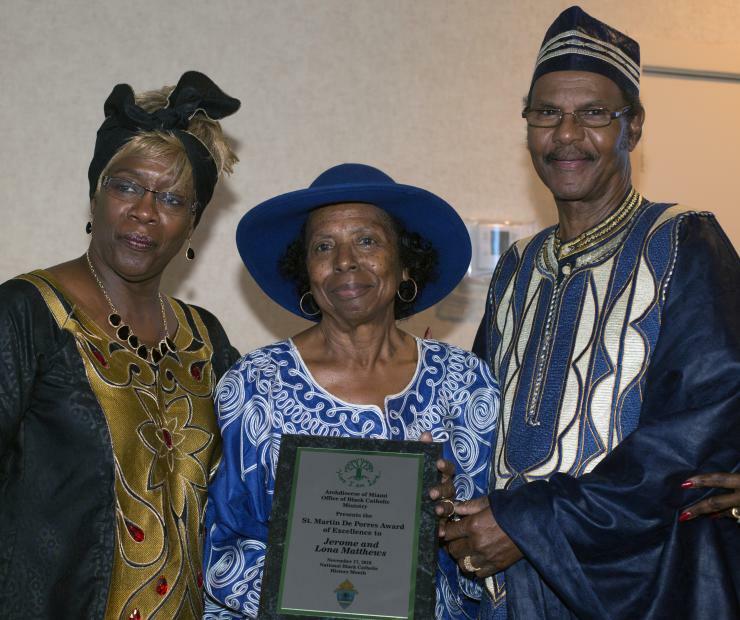 Joseph Blaize, of Christ the King Church in Perrine, holds his St. Martin de Porres Award of Excellence as he poses for a photo with his wife, Ethel Rose Blaize, left, and Vanya Albury, president of Christ the King Church's black Catholics group. Ida Muorie, author of Black Catholics in America, delivers her speech at the annual Black Catholic History Month luncheon, Nov. 17 in Miami Gardens. Katrenia Reeves Jackman, director of the archdiocesan Office of Black Catholic Ministry, poses with Msgr. Chanel Jeanty, the ministry's chaplain, who was honored with a special award, the Father Augustus Tolton award of excellence. At right is Donald Edwards, associate superintendent of schools for the archdiocese. Evelyn McGuffie stands by as Vinella Booz, of St. James Church in North Miami, holds her St. Martin de Porres award alongside her pastor, Msgr. Chanel Jeanty, who also serves as chaplain of the ministry to black Catholics. Katrenia Reeves Jackman, director of the Office of Black Catholic Ministry, poses with Lona and Jerome Matthews of St. Philip Neri Church in Miami Gardens, who received one of this year's St. Martin de Porres awards. 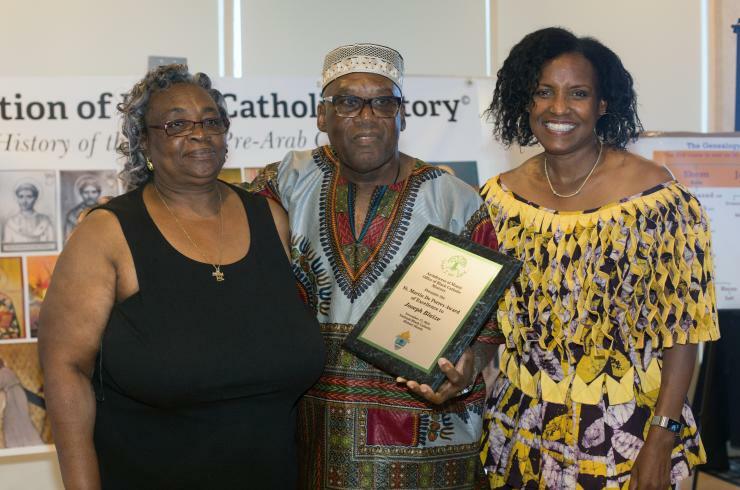 St. Martin de Porres award recipient Jimmie Knowles, of Holy Redeemer Church in Liberty City, holds his award while posing for a photo with Claire Worthy and Father Alexander Ekechukwu, Holy Redeemer's pastor. 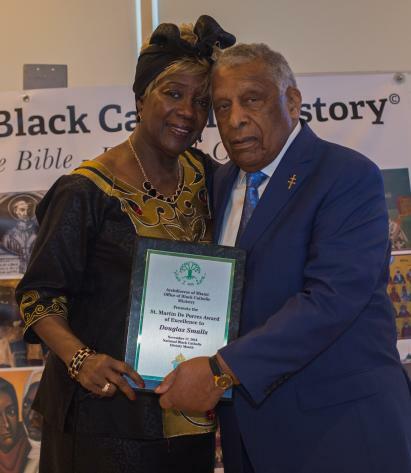 Brenda Dawson, of St. Katharine Drexel Church in Weston, holds her award as Katrenia Reeves Jackson, director of the Office of Black Catholic Ministry, and Dawson's husband, Deacon Thomas Dawson, pose for a photo. St. Martin de Porres awardee Roslyn Taylor poses for a photo with Audrey Hyman, a fellow parishioner at Visitation Church in North Miami. Katrenia Reeves Jackman, director of the Office of Black Catholic Ministry, poses for a photo with St. Martin de Porres awardee Douglas Smalls, of Blessed Sacrament Church in Fort Lauderdale. Megan Juste, 12, and Kayla Weaver, 7, members of Mbofro Ne Nyame, "Children and God" dance group, perform for the audience during the Archdiocese of Miami's Office of Black Catholic Ministry celebration of Black Catholic History Month, Nov. 17 in Miami Gardens. MIAMI GARDENS | When Douglas Smalls was a baby he became very ill. He was hospitalized and in need of a blood transfusion. Doctors told his parents he would most likely die, and they ought to call on their minister for prayer. Douglas’ father then went to the local YMCA seeking a proper blood donor. A man there volunteered, came to the hospital, donated his blood and left. Miraculously, Douglas lived. His father went back to the YMCA to thank the man. He was told no such man had been there. To this day, the Smalls think it is possible that the man was an angel. “My mother declared that, from that moment on, we would be Roman Catholic,” said Smalls, who has remained faithful to his mother’s vow and supports the Church with his time, talent and treasure. A parishioner of Blessed Sacrament in Fort Lauderdale, his life has been one of service to the Lord and the Church. 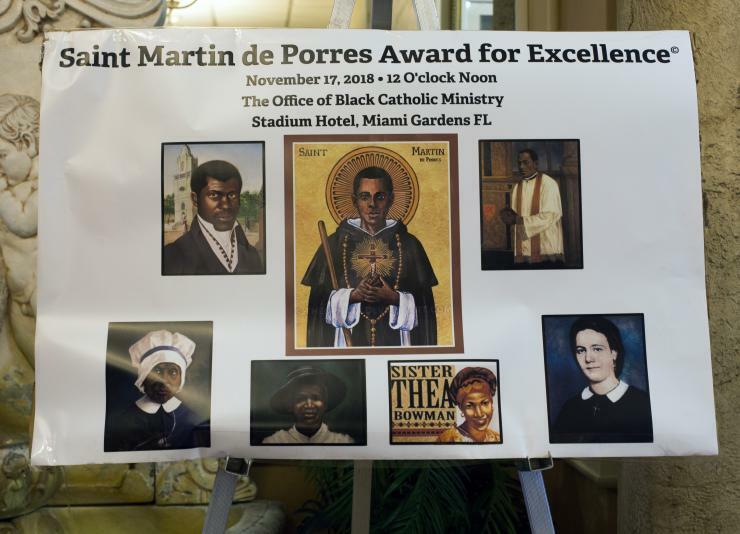 Recently, Smalls and seven others received St. Martin de Porres Awards for Excellence from the Archdiocese of Miami’s Office of Black Catholic Ministry, which presents them every year during November, Black Catholic History Month. Others receiving the awards at the Nov. 17 luncheon were Brenda Dawson, Jimmie Knowles, Joseph Blaize, Vinelia Booz, Roslyn Taylor and Jerome and Lona Bethel Matthews. 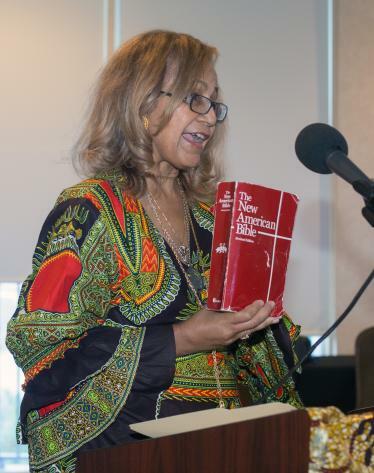 Ida Muorie, author of Black Catholics in America, delivers her speech at the annual Black Catholic History Month luncheon, Nov. 17 in Miami Gardens. Msgr. 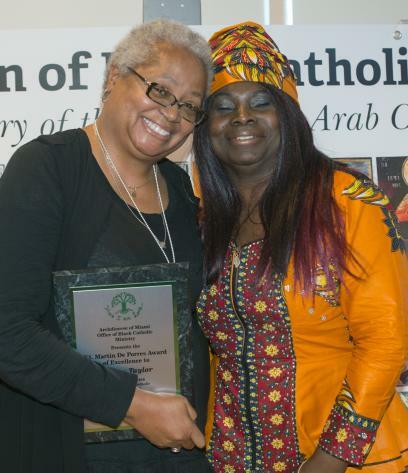 Chanel Jeanty, chaplain of the ministry to black Catholics, also received a special recognition, the Father Augustus Tolton Award of Excellence. Msgr. Jeanty is pastor of St. James Church in North Miami in addition to serving as archdiocesan chancellor for canonical affairs. Dawson, from St. Katharine Drexel Church in Weston, is a retired teacher and lay minister. She founded and is CEO of the non-profit “I AM Ministries” of Miami-Dade/Broward Inc. The organization’s mission is to restore and empower family life. The ministry’s “Divas Destined for Greatness” is a mentoring and character-development program that has served teenage girls for the past 10 years. Dawson has written two support manuals, Women’s Empowerment Hour and Divas Destined for Greatness, which guide and direct these programs. Like Dawson, Jerome and Lona Matthews are retired Miami-Dade teachers. They have been active in their church, St. Philip Neri in Miami Gardens, for many years. Jerome serves in the Men’s Club and is a lector and altar server. Lona was first president of the church’s Catholic Youth Organization. Both husband and wife serve as extraordinary ministers of Holy Communion and visit those who are ill and homebound, hospitalized or in nursing/rehabilitation/assisted living facilities. Knowles serves Holy Redeemer Church in Liberty City in the adult choir, Men’s Club, transporting the elderly to Mass and other religious events, and helping the pastor, Father Alexander Ekechukwu, around the church. Booz, from St. James Church in North Miami, is a committed volunteer. She attends to the less fortunate by replenishing the parish pantry weekly, works in the parish gift shop, and when needed volunteers at the front office. She is an extraordinary minister of Holy Communion and has served as coordinator of the liturgical committee for the past five years. Blaize is head usher at Christ the King Church in Perrine, extraordinary minister of Holy Communion, lector, Mass coordinator, liturgy coordinator and member of the Finance Council. He is an active participant in the Black Heritage Ministry and People Acting for Community Together, PACT. He is a leader in the St. Vincent de Paul Society at the parish and district conference levels. Taylor, a member of Visitation Church in North Miami, is the youth choir director and a facilitator in the Communion and Liberation group. She joined the Third Order of St. Dominic (Lay Dominicans) in 2000. The event’s speaker, Ida Muorie, is a lawyer, former college educator, social worker, financial executive and author of the blog Black Catholics in America. She wrote “Foster Care In-Laws: Families Belong Together,” which is described as a “wake-up call for a billion-dollar industry that continues to warehouse children and discriminates against older children and minorities.” She spent seven years working in inner-city Atlanta as a social worker, where she says she witnessed many social problems. 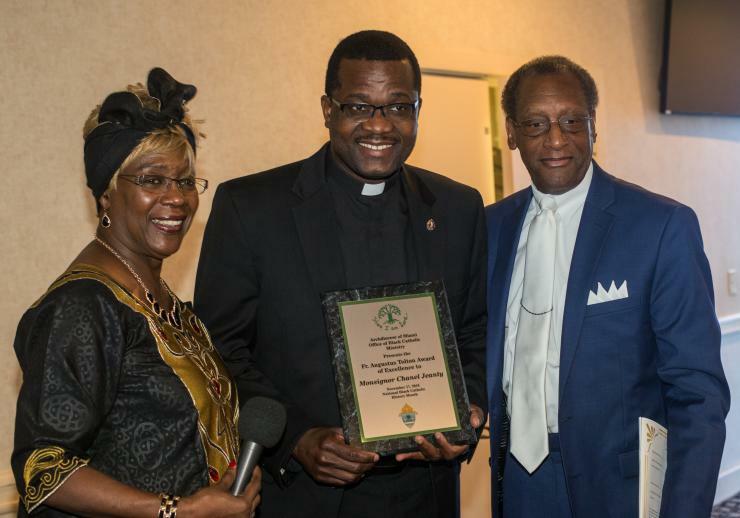 Katrenia Reeves Jackman, director of the Office of Black Catholic Ministry, poses with Lona and Jerome Matthews of St. Philip Neri Church in Miami Gardens, who received one of this year's St. Martin de Porres awards. 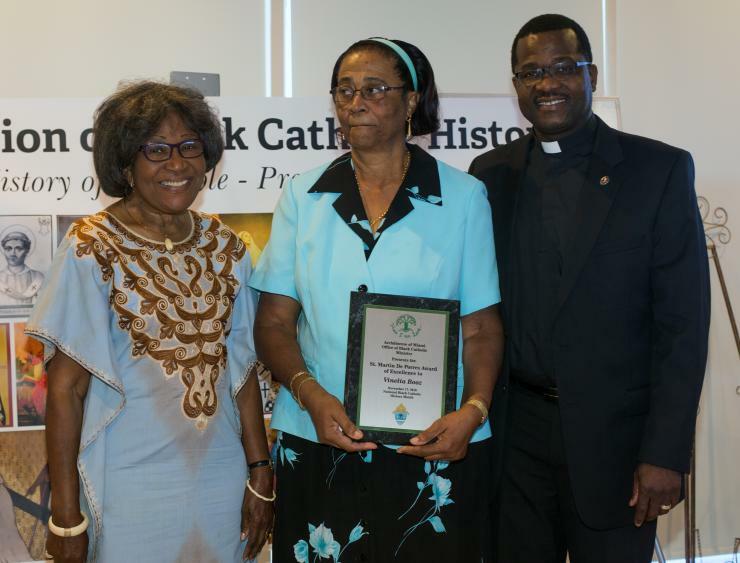 The archdiocesan Office of Black Catholic Ministry celebrated Black Catholic History Month by presenting its annual St. Martin de Porres awards to exemplary members of the community. The awards were presented during a luncheon Nov. 17 in Miami Gardens. In a written message, Archbishop Thomas Wenski congratulated the ministry on the 28th anniversary of the celebration. “This is a continuing effort on the part of the United States Catholic Church to raise awareness and appreciation of the black Catholic heritage and the gift that all of you have to offer in continuing the dynamic diversity that makes our faith all the more beautiful and relevant in the past 60 years of existence of the archdiocese,” he said. 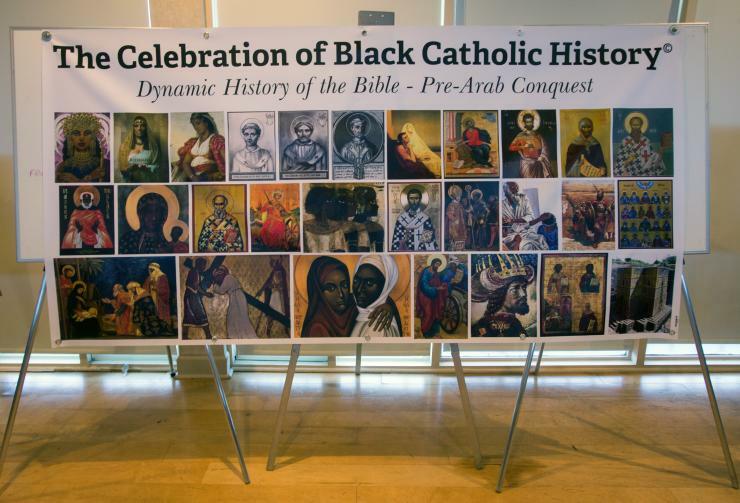 The theme for this year’s Black Catholic History Month celebration is faith, freedom and focus, said Katrenia Reeves Jackman, director of the archdiocesan office of black Catholics. The ministry is working and praying for the canonization of six black Catholic candidates for sainthood: Venerable Mother Henriette Delille, Servant of God Mother Mary Lange, Servant of God Augustus Tolton, Venerable Pierre Toussaint, Servant of God Sister Thea Bowman and Julia Greely. Katrenia Reeves Jackman, director of the archdiocesan Office of Black Catholic Ministry, poses with Msgr. Chanel Jeanty, the ministry's chaplain, who was honored with a special award, the Father Augustus Tolton award of excellence. At right is Donald Edwards, associate superintendent of schools for the archdiocese. Correction: This article originally said Archbishop Thomas Wenski had attended the luncheon. He did not, but wrote a message that was published in the luncheon program.